NATFA is the most popular institution for Theatre and Film Arts Education in Bulgaria, situated in the heart of the capital city named Sofia. NATFA is training around 650 students and has around 85 full time professors. The Academy Teaching Staff are known for their high artistic achievements both in the country and abroad. Their teaching is informed by their rich professional experience, and they aspire to develop curricula and programs which meet the individual needs of the students and enable them to form their own creative and methodological approaches. I WAS SELECTED BY MY UNIVERSITY. WHAT NOW ? 1. 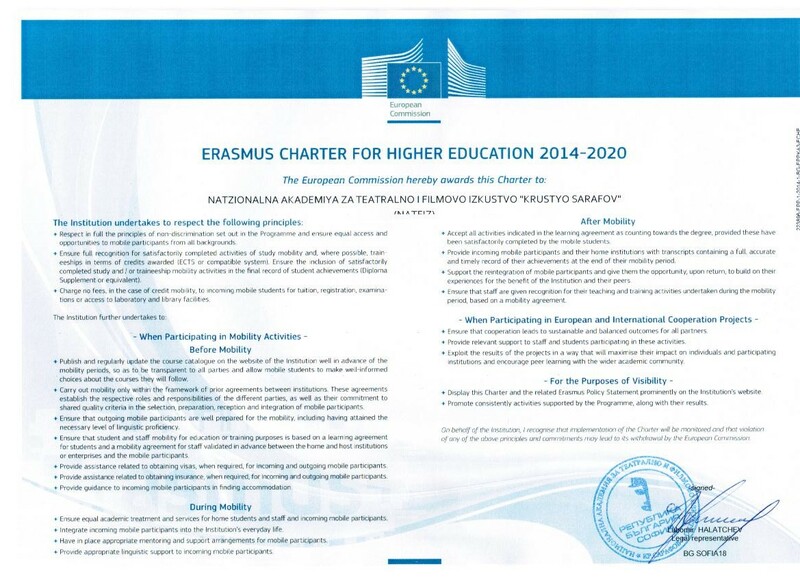 Nomination from you university: your university has to nominate you as an Erasmus student at NATFA. Accommodation: All Erasmus students can be accommodated at reasonable prices in its special Dormitory situated on the premises of the Sofia Students’ Campus. The campus never stops living and its infrastructure includes sports’ facilities, a wide variety of restaurants, recreational and entertainment canters, a specialized polyclinic hospital, shopping areas, children playgrounds and nursery-schools, low-price students’ diners and a convenient transport network. Hope you will have a fruitful and unforgettable stay here.